Dr. Bellezza—the first podiatrist to join the Multi-Specialty Group—would be featured in a series of announcement cards, newspaper ads, Facebook posts and local newspaper features. 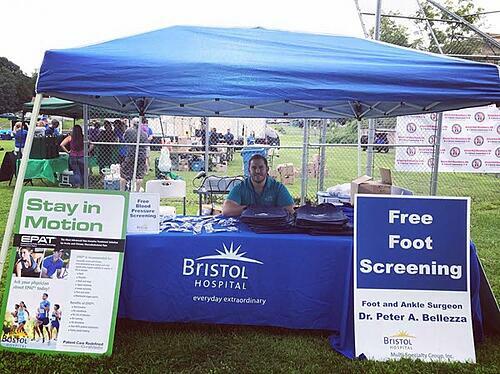 But Dr. Bellezza wanted to hit the ground “running” and attend some local road races and marathons to conduct free foot checks for all those in attendance. Each road race that took place in the late summer and fall would yield an average of 16 runners with questions on their foot, ankle and heel pain. Many of these encounters turned into office visits and eventually even some surgeries. 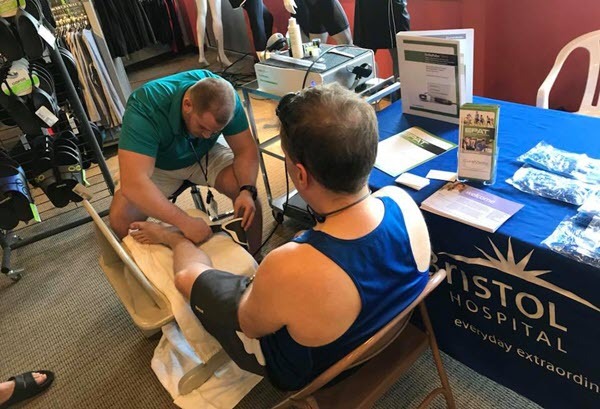 Soon after Bristol Hospital acquired the STORZ Medical EPAT device from CuraMedix, an opportunity presented itself at Fleet Feet, a West Hartford store that specializes in footwear for running, walking, cross-training and fitness. James Diamond, senior practice manager for the Bristol Hospital Multi-Specialty Group, oversees the Center for Orthopedic and Spine Health and is a regular customer of Fleet Feet. Diamond coordinated a two-and-a-half hour event at the Fleet Feet store where Dr. Bellezza would educate the attendees about the advantages of EPAT and how it works, as well as offer free treatments. Fleet Feet heavily promoted Dr. Bellezza’s appearance and more than a dozen customers showed up to experience the EPAT demo. Dr. Bellezza personally transported the EPAT machine from his office in Southington, Conn. The event was an overwhelming success with several of the Fleet Feet customers making appointments with Dr. Bellezza to continue the EPAT treatments. The next tactic deployed was suggested by Dr. Bellezza—why not actually bring the EPAT out to some of the road races that we are covering? A portable Honda generator was purchased to power the EPAT which was housed on a cart in the portable event canopy/tent. One of the runners who came to the Bristol Hospital tent was a physical therapist who worked in a practice just across the hallway from Dr. Bellezza’ s office in Southington. Pleased with the EPAT demo, she invited Dr. Bellezza in for an in-service for all the physical and occupational therapists in the practice. As the Director of Public Relations, my main focus is on media relations and gaining as much free publicity for the service lines via my earned media efforts. The news media and public relations exposure is very important because remember—marketing is what you say about yourself—public relations is what others say about you. I’m always amazed at the reach local television news has. The local FOX affiliate in Hartford produced a feature on Dr. Bellezza and the EPAT. The news hook here was that no other television news outlet interviewed Dr. Bellezza on the EPAT, and that Bristol Hospital is one of a handful of hospitals in Connecticut that utilizes this technology. Another key earned media tactic is a bi-weekly wellness column that I write for our local daily newspaper, the Bristol Press. Because this is an editorial piece, I had to keep this copy more generic and not use the CuraMedix brand in the article because there is a fine line with turning this column into a free advertisement for Bristol Hospital. The bottom line here is that providers need to do some heavy lifting when it comes to growing their service line. Dr. Bellezza understands that it's more than ads and billboards—we need boots on the ground to meet potential patients in person—and Dr. Bellezza’s growing numbers prove this theory. Chris Boyle is the director of public relations at Bristol Hospital and Health Care Group. He has more than 20 years of health care communications experience and is the co-chair of the Communications Executives Committee of the Connecticut Hospital Association, and serves on the Executive Committee of the PRSA Health Academy.